Smart speakers are the fastest-growing consumer technology today, outstripping augmented reality, virtual reality, and even wearables, according to Canalys, a global technology market analyst firm based in Singapore. Worldwide shipments of smart speakers grew to 78 million units in 2018, up 125 percent from 35 million in 2017. In the third quarter of 2018, 42 percent of smart speakers were shipped to the United States, making it the single most important market for smart speakers. Google and Amazon lead the market and accounted for 62 percent of global shipments in the third quarter of 2018. New vendors, such as Alibaba and Xiaomi, are, however, increasing competition in this historically narrow competitive landscape. Future market growth for smart speaker technology, particularly in the largest existing markets, will likely involve moving speakers beyond the realm of hardware sales and into further monetizing the speakers that already exist in users' homes. One solution may just lie in the explosive growth of e-commerce. While the majority of smart speaker owners use their devices to ask for music and weather forecasts, only a very small segment makes purchases directly through smart speakers. 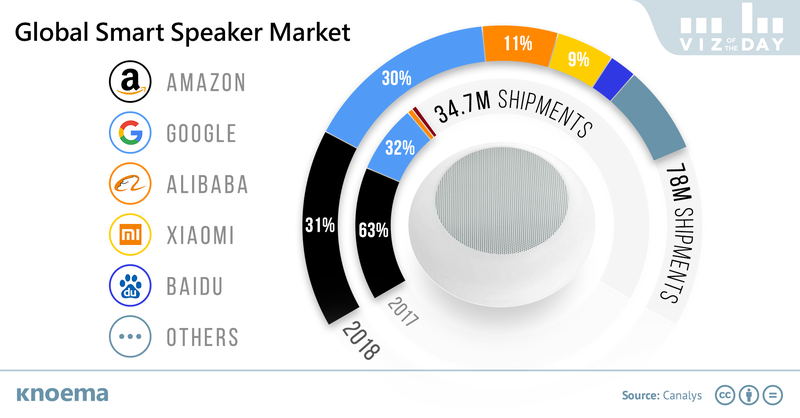 According to a February 2019 survey of 1,000 US consumers by Adobe Analytics,* only 26 percent of US smart speaker owners use speakers for shopping in February 2019, down from 30 percent in August 2018. If used at all, voice assistants are typically limited to the early stages of the shopping process: product search, price comparisons, and creation of shopping lists.